Bloom is an effect used to reproduce an imaging artifact of real-world cameras. The effect produces fringes of light extending from the borders of bright areas in an image, contributing to the illusion of an extremely bright light overwhelming the camera or eye capturing the scene. 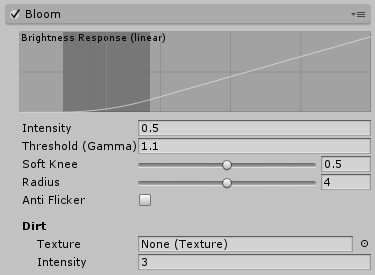 In HDR rendering a Bloom effect should only affects areas of brightness above LDR range (above 1) by setting the Threshold parameter just above this value. Intensity Strength of the Bloom filter. Threshold Filters out pixels under this level of brightness. Soft Knee Makes transition between under/over-threshold gradual (0 = hard threshold, 1 = soft threshold). Radius Changes extent of veiling effects in a screen resolution-independent fashion. Anti Flicker Reduces flashing noise with an additional filter. With properly exposed HDR scenes, Threshold should be set to ~1 so that only pixels with values above 1 leak into surrounding objects. You’ll probably want to drop this value when working in LDR or the effect won’t be visible. Anti Flicker reduces flashing noise, commonly known as “fireflies”, by running an additional filter on the picture beforehand. This will affect performances and should be disabled when Temporal Anti-aliasing is enabled. Lens Dirt applies a fullscreen layer of smudges or dust to diffract the Bloom effect. This is commonly used in modern first person shooters. Texture Dirtiness texture to add smudges or dust to the lens. Lens Dirt requires an input texture to use as a fullscreen layer. There are four Lens Dirt texture supplied in the Post-processing stack that should cover common use cases. These textures are supplied at 3840x2160 resolution for maximum quality and should be scaled dependent on project and platform. You can create custom Lens Dirt textures in any image editing software.